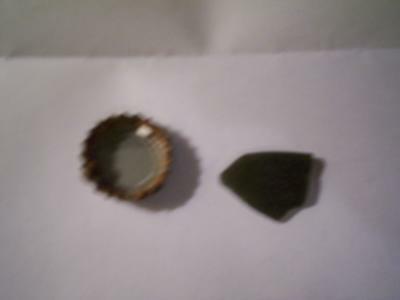 After a day of rain and a steady wind blow, up the coast, my boyfriend and I decided to walk and look for sea glass. One of todays finds was amazing! On the sand it looks black....but when you hold it up to light its a dark green color. 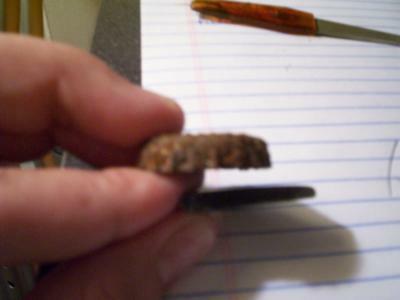 Here is a pic of the piece. I took the pic with a bottle cap next to it to give you an idea of size. We found between 10-15 pieces today with this one being the biggest. 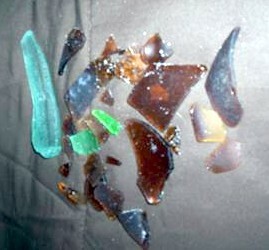 Usually find up to 10-15 pieces of sea glass on a good day! Range of colors- ambers, browns, LIGHT blue, frosted clear/white, CRANBERRY RED! also ranges from sharp edges to frosted and everything in between! It is at a State Park, so you will have to pay to visit, no dogs, lots of small rocks lots of shells too! The pic that has been uploaded was all found in 1 Trip on September 18, 2011- minus the mexican made onyx chess piece that was found as well.